A compelling new production of Modest Mussorgsky’s colossal masterpiece Khovanshchina has been met with success at Milan’s Teatro alla Scala in front of an attentive and committed audience. The production was directed by Mario Martone, who, thanks to the expert contribution of set designer Margherita Palli, set the action in what he referred to as a ‘dystopic future’, clearly inspired by collective memories from science fiction movies. Perhaps because it was originally set in 2019, the main source of inspiration clearly comes from the setting of Blade Runner, with a lonely drone flying among the forsaken buildings of a post-catastrophe town. Similarly, the third act sets, with a wrecked car on its side on a white-grayish background looks like a literal citation from the movie’s sequel Blade Runner 2049. Even the palaces of Princes Golitsin and Khovansky in the second and fourth act look partly torn down. In the finale, the red moon that dominates the background turns out to be a giant asteroid that moves forward and destroys the earth in a storm of fire. In such a hopeless world, the bloody deeds of the ferocious princes are met with despair and resignation by the people, while the blood-thirsty Strel’cy push for further battle, and the Old Believers accept death in their religious exaltation. Among the conspicuous cast, the characters that mostly stand out are those of Ivan Khovansky, the bold and boastful leader of the Strel’cy, and of Marfa, a prominent figure among the Old Believers, here interpreted by bass Mikhail Petrenko and mezzo Ekaterina Semenchuk respectively. Petrenko’s imposing stage presence fitted perfectly for the arrogant Khovansky, and his confrontation with Principe Golitsin, interpreted by tenor Evgeny Akimov, convincingly reflected the contrast between two different manners of approaching power. Vocally, Akimov portrayed a smooth Golitsin, with a well-supported emission that enabled him to mold his voice to depict the various facets of this ambitious character. Tenor Sergey Skorokhodov was a hesitating and even frightened Andrey Khovansky, torn between his passion for Emma (soparno Evgenia Muraveva, luxury casting for this small role), his obligations toward his father, and fear for his life in the last act, in which he collapsed under the towering personality of Ekaterina Semenchuk, an outstanding Marfa, whose sumptuous voice utterly mastered the demanding score. Bass Stanislav Trofimov was a stylish and restrained Dosifei, while Alexey Markov showcased his handsomely colored and sizeable baritone portraying a determined Shaklovitïy. Also compelling was Maxim Paster, who was able to turn a relatively small voice into an asset depicting a coward, though greedy, scribe. Among the main protagonists of this opera is the chorus, in the roles of the Strel’cy, the Old Believers, or the simple illiterate Russian people, who suffer the course of the events brought about by the power-thirsty noblemen. 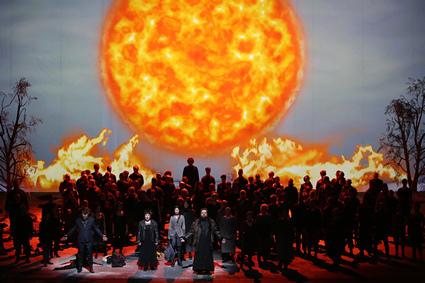 La Scala’s chorus, under the lead of Bruno Casoni, is one of the company’s main assets, and its contribution to the performance was simply superlative. After more than twenty years, it was again Valery Gergiev who lead the company’s orchestra and a close-knit cast of high profile singers. The Russian Maestro conducted with great care and inspiration, getting a perfect response from the orchestra which sounded at its very best.